This example supposes that you have a proxy and want it to add logging information. Thus, we’ve defined a contract (interface) called IProxy to define the expected behavior of our proxy. Then, we have in a separate project an concrete implementation Proxy which implements the interface IProxy. At last but not a least, we have a project which defines a Unity interceptor. All these components are united by the configuration file which lets unity know how these components should interact. The second project we’re going to talk is where the interceptor is defined. As we’ve already mentioned the interceptor will allow unity to perform tasks before and/or after the intercepted method is invoked. To define which method is going to be intercepted, we can use two alternatives: 1)a configuration file or 2) by writing some code. I’ll talk about the Unity configuration file once I explain the AspectOriented.Terminal’s project. As you might noticed the interceptor implements IInterceptionBehavior which will let Unity know that this class can act like an interceptor. 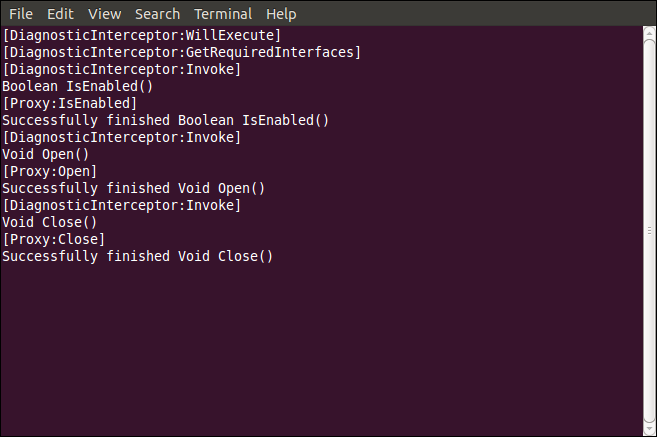 To simplify things, the interceptor will print message only when the intercepted method is invoked. The printed information is about the method being invoked. However, interceptors can perform more complex such as starting threads, performing web requests and so on. This is the main project which generates the executable file. Here are two important things to point out. First we’ve configured our container here. In this case Unity has being configured by using the configuration file, however you can use code instead. The second, the main application performs calls on the instance that unity resolves, the interception process happens behind scenes and we only will see the result when we call the methods of the proxy. The configuration file defines two section which are mandatory to define interceptors, these are sectionExtension and extension. Then into the registration of a given type (or in our sample the IProxy Type) we can define the interceptors for this particular type resolution. At last but not least we’ve our main code. It’s quite straightforward, it creates a Unity container, loads the container configuration from the configuration file, and then uses the container to resolve the given interface (contract). As I mentioned the magic happens behind-scenes, when you call the Proxy methods there is functionality which is going to be injected before and after each call of this instance. Take a look of the final screen-shot to see the all the terminal messages which were triggered during the method calls of the Proxy. As you can notice the interception calls are injected before and after each call of the intercepted methods of our proxy instance. Furthermore, we can inject the same logic to different contracts (interfaces) by only updating the configuration file. If there is not a contract, it is still possible to perform interception, Unity 2 supports three mechanisms for interception, just keep in mind that each mechanism has its pros and cons. Remember that same functionality can be plugged to any other component (instance) by using the same mechanism.